Your message was sent! Did it make it to the recipient’s inbox? Did it have the return on investment (ROI) that you anticipated? Email marketing is one of the most efficient and cost effective ways to convey your message, boost your brand and promote your services. It needs to be part of your overall marketing plan. With that being said, every time you decide to design and send out an email campaign you have to make sure that it has the best chances of being a success. 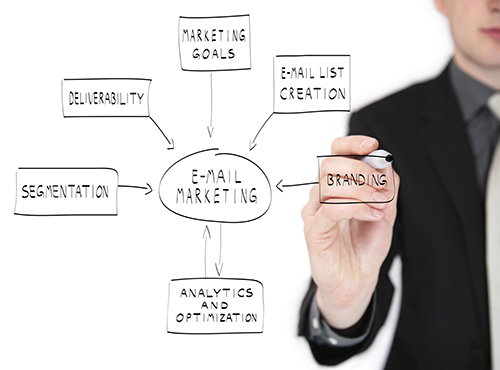 The email marketing strategy steps below are going to help you achieve this. Every email marketing campaign that goes out needs to communicate a specific message and address specific needs. For example, inviting clients to visit your website in order to find out more about your services is different than inviting candidates to apply for open positions. As a consequence, sending the same email to your entire database is not going to have the same results as if it was to be sent to an audience that was segmented based on criteria such as interest, company size, location etc. When you know who your target is, you make it much easier for your email campaign to reach it. You need to keep in mind that apart from you, your audience receives emails from your competitors as well. Like you, they want to grow their market share, and email marketing is a great tool to do that. One of the email marketing strategy steps that are going to set you apart from competition and increase your open rates is personalization. Instead of using the same generic greeting for everyone at the opening of your message, personalize your emails by addressing recipients with their first name. Today’s email service providers give you this ability. Similarly, use a real email address that your audience can reply to if they decide to do so and avoid using sender email addresses that reduce credibility. The number of people who open emails using a mobile device is constantly growing. When people try to read an email that they received on their phone or tablet, they don’t want to come across unformatted messages with images that are not optimized. If they do, chances are that they are going to delete them and unsubscribe from receiving them again. To avoid losing a huge part of your audience, you need to optimize your campaigns for mobile devices. Make certain that you give your messages a responsive email design and ensure that your team makes this process one of your email marketing strategy steps. Unless you have time to waste, you need to ensure that your email campaigns achieve the goal for which they were initially designed and launched. The purpose is to draw attention and intrigue the recipients to take action. From applying to an open position, to visiting your website for more information, to filling out a form, to getting in touch with you, your emails need to include triggering calls-to-action that encourage readers to take the action you want. This doesn’t mean that you have to overfill your emails with buttons and graphics, but rather be consistent and to the point. One of the most important email marketing strategy steps that you have to take into account every time you plan for an email campaign is testing. Sending out emails with grammar mistakes or spelling errors, pointing to broken links and including images that take an eternity to load, is not going to have a positive impact on your open rates. Remember that your email marketing plan is part of your overall marketing strategy so it is another tool to build credibility towards your brand. In other words, be proactive in catching flaws before your messages end up in your audience’s mailboxes.